Dietetics is a self-governing health profession in Ontario under the Regulated Health Professions Act, 1991 (RHPA). Under the RHPA, it is the duty of the Minister of Health and Long Term Care to ensure that health professions are regulated and co-ordinated in the public interest. To develop, establish and maintain standards of knowledge and skill and programs to promote continuing competence among the members. To develop, establish and maintain programs to assist individuals to exercise their rights under this Code and the Regulated Health Professions Act,1991. To administer the health profession Act, this Code and the Regulated Health Professions Act,1991, as it relates to the profession and to perform the other duties and exercise the other powers that are imposed or conferred on the College. To promote and enhance relations between the Colleges and its members, other health profession colleges, key stakeholders, and the public. To develop, establish and maintain standards and programs to promote the ability of members to respond to changes in practice environments, advances in technology and other emerging issues. 12. To engage in and facilitate, with appropriate partners, human health resource planning and research and direct the Executive Committee and Registrar/ED to take appropriate action, including entering into agreements and arrangements with third parties to achieve this object.In carrying out its objects, the College has a duty to serve and protect the public interest. The legal powers and duties of the College are set out in the RHPA, the Health Professions Procedural Code and the Dietetics Act, 1991. The activities of the College are subject to a number of oversight mechanisms including both general and specific oversight by the Ontario Minister of Health and Long-Term Care and specific oversight by the Health Professions Appeal and Review Board, the Health Professions Regulatory Advisory Council and the Office of the Fairness Commissioner. In the course of fulfilling its mandate, the College may collect, use and disclose personal information regarding applicants for membership, members, members’ patients and persons employed, retained, elected or appointed for the purpose of the administration of the Legislation. b) to a College within the meaning of the Regulated Health Professions Act, 1991 for the purpose of the administration or enforcement of the Drug and Pharmacies Regulation Act, the Regulated Health Professions Act, 1991 or an Act named in Schedule 1 to that Act. In addition, personal information handled by the College is subject to the provisions of this Privacy Code. The College's collection, use and disclosure of personal information in the course of carrying out its regulatory activities is done for the purpose of regulating the profession in the public interest, human resources planning and quality care management. These activities are not of a commercial character. Accordingly, the performance of the College of its statutory duties is not covered by the federal legislation titled the "Personal Information Protection and Electronic Documents Act." The College has adopted this Privacy Code voluntarily to provide a mechanism through which the College can provide appropriate privacy rights to individuals involved in the College's activities, while still enabling the College to meet its statutory mandate under the RHPA, the Health Professions Procedural Code and the Dietetics Act, 1991. "Board" means the Health Professions Appeal and Review Board. "By-laws" means the by-laws of the College passed under the authority of section 94 of Health Professions Procedural Code. "Client" is deemed to include an individual, family and/or substitute decision-maker, group, agency, employer, employee, organization, or community who is a potential or actual recipient of the dietitian’s expertise. The client is unique and diverse in needs, culture, motivations, resources, religion, and perception of wellness to whom an applicant or member of the College has purported to provide professional services. 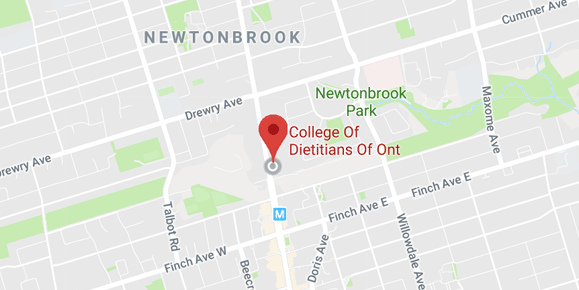 "College" means College of Dietitians of Ontario. "Inquiries, Complaints and Reports Committee" means the Inquiries, Complaints and Reports Committee of the College as required by s. 10 of the RHPA Procedural Code. "Discipline Committee" means the Discipline Committee of the College as required by s. 10 of the RHPA Procedural Code. "Legislation" means the RHPA, RHPA Procedural Code, Dietetics Act, 1991, Regulations and By-laws. "Member" means a member of the College. "Organization" includes an individual, a corporation, an association, a partnership, and a trade union. "Personal information" means information about an identifiable individual but does not include the name, title, business address or business telephone number of an individual or any other information required to be posted on the College’s website by the RHPA or College by-laws. "Privacy Committee" means the Executive Committee. "Profession Specific Act" means Dietetics Act, 1991. "Registration Committee" means the Registration Committee of the College as required by s. 10 of the Health Professions Procedural Code. "Regulations" means the regulations made under the RHPA and/or regulations made under the Dietetics Act, 1991. "RHPA" means the Regulated Health Professions Act, 1991 as amended from time to time. "RHPA Procedural Code" means the Health Professions Procedural Code (being Schedule 2 to the RHPA). The College will provide orientation and training to all new employees and appointees as well as all members of Council, committees or working groups regarding their obligations pursuant to section 36 of the RHPA and this Privacy Code. All employees, council, committee and working groups members and contractors who have access to personal information sign confidentiality agreements with reference to the secrecy provisions of the RHPA. The College’s confidentiality policies for employees, Council and committees and the Record & Retention Policy are available on request. The purpose for which the College collects, uses and discloses personal information is to administer and enforce the legislation, to support human resources planning and contribute to the management of quality in the delivery of patient care. The College may collect personal information regarding a member from the member, employers and colleagues of the member, patients of the member and other persons, for the purposes set out above. Personal information regarding members is collected by the College from time to time and at regular intervals. The College discloses personal information regarding its members only as permitted by section 36 of the RHPA or as required by law or to transfer information about members to establish the ehealth provider registry. For example, the College is required under the RHPA Procedural Code to maintain a register containing information about its members on its website. The RHPA Procedural Code and the By-laws require the College to provide access to designated information to a person who requests it. The College may collect personal information regarding an employer, colleague and patient of a member of the College from the employer, the colleague, the patient the member and other persons, for the purposes set out above. The College discloses personal information regarding the employers, colleagues, patients of members of the College only as permitted by section 36 of the RHPA or as required by law or to transfer information about members to establish the ehealth provider registry. For example, hearings of the Discipline Committee are required, subject to certain exceptions, to be open to the public. Evidence at a hearing of the Discipline Committee may include personal information regarding the member of the College who is the subject of the allegation of professional misconduct or incompetence, as well as personal information regarding the member's patients related to the allegations of professional misconduct or incompetence. Another example of disclosure of personal information about patients of members of the College relates to complaints regarding the conduct or actions of members of the College. Where a complainant, who is frequently a patient of a member, or a member does not agree with a decision of the Complaints Committee, subject to certain exceptions, either person can request a review by the Board. The RHPA Procedural Code requires that the College disclose to the Board a record of the investigation and the documents and things upon which the decision was based. This disclosure of personal information about a patient of a member to the Board is required under the RHPA Procedural Code. Personal health information disclosed to the College by a custodian is only used for the purpose for which the disclosure was made (i.e., to enable the College to regulate its members and the practice of the profession) or to enable the College to carry out its statutory and legal duties. This is consistent with s. 49 of the Personal Health Information Protection Act, 2004. The College collects and uses personal information regarding applicants and potential members, the patients of applicants and potential members and the dietitians who supervise applicants or potential members to assess whether an applicant or potential member meets, and continues to meet, the standards of qualification to be issued a certificate of registration and to administer or enforce the Legislation. The College discloses personal information regarding applicants and potential members and their patients only as permitted by Section 36 of the RHPA or as required by law. For example, the RHPA Procedural Code provides a procedure for an applicant who does not agree with a decision of the Registration Committee to request a review or a hearing by the Board. The RHPA Procedural Code requires that the College disclose to the Board a copy of the order and reasons of the Registration Committee and the documents and things upon which the decision was based. This disclosure of personal information to the Board is required under the RHPA Procedural Code. The College collects and uses personal information regarding individuals who may be practising the profession of dietetics or holding themselves out as practicing the profession and their patients to investigate whether the individual has contravened or is contravening the Legislation and to administer or enforce the Legislation. The College discloses personal information regarding such individuals only as permitted by section 36 of the RHPA or as required by law. To maintain accurate and fair accounts of any disputes, possible conflicts of interest or misconduct involving a person retained or appointed for the purpose of the administration of the Act or a member of the Council or committee of the College for purpose of making payments and providing benefits. The College discloses personal information regarding the individuals referred to above only as permitted by section 36 of the RHPA or as required by law. Where practicable, the College will make a reasonable effort to specify the identified purposes to the individual from whom the personal information is collected, either at the time of collection or after collection but before use, except where to do so would defeat the purpose of the Legislation or be inconsistent with the Legislation. The College will state the identified purposes in such a manner that an individual can reasonably understand how the information will be used or disclosed. Where personal information is collected for one purpose, the College reserves the right to use and disclose the information for another regulatory purpose where it is in the public interest to do so. For example, when the College is investigating a complaint it may review the other files at the College about that member as it is required under the RHPA Procedural Code, subject to some limited exceptions, to consider all prior decisions involving the member. The College collects personal information for purposes related to its objects (see Preamble for the College's objects) including for the purpose of the proper administration and enforcement of the Legislation and for other related regulatory purposes. In carrying out its objects, the College has a duty to serve and protect the public interest. Where practicable, the College will make a reasonable effort to specify the identified purposes to the individual from whom the personal information is collected as described in Principle 2 and to obtain his or her consent. However, obtaining consent from the individual would, in many cases, defeat the purpose behind the College's collection, use and disclosure of the personal information. Personal information will only be collected, used and disclosed without the knowledge and consent of the individual for the purpose of the administration or enforcement of the Legislation and in accordance with any applicable provisions of the Legislation. For example, personal information about a patient may be collected and used without the patient's consent for the purpose of the College's quality assurance program regarding the assessment of a member's practice in accordance with the RHPA Procedural Code and the Regulations. Another example is that personal information about a patient may be collected and used without the patient's consent for the purpose of an investigation of a member in accordance with the RHPA Procedural Code and the Regulations. The College collects only the personal information that is required for the purposes identified in Principle 2 of this Privacy Code. The College collects personal information using procedures that are fair and lawful. Personal information regarding patients must be collected as part of the College’s regulatory function. This information is typically obtained by the College as part of an investigation, inquiry or quality assurance program. The focus of these inquiries is the conduct, competence or capacity of the member and the protection of the public. The College only collects personal information regarding patients to satisfy this regulatory purpose and any purposes that flow from it, such as holding hearings. The College uses personal information only for the purposes identified in Principle 2 and in accordance with the provisions of the Legislation. Personal information is only disclosed for the purposes identified in Principle 2 of this Privacy Code. Quality Assurance personal information about a member and his/her clients is removed if used by the Quality Assurance Committee or a panel of the committee. Access to most personal Quality Assurance information about a member is limited to the Quality Assurance program staff, committee and the Registrar. Exceptions exist, however, where there are concerns that the member is incompetent, incapacitated or may have committee an act of professional misconduct or where the member fails to cooperate with the Quality Assurance Committee or any assessor appointed by that committee. The RHPA Procedural Code and College by-laws clearly designate the information regarding members that is publicly available. They can be accessed from the College website at www.collegeofdietitians.org or by contacting the College at 416-598-1725 or 1-800-668-4990. Under certain circumstances, the College has the legal authority to disclose personal information including health information without consent. For example, information about complaints and reports, including information collected during an investigation, may be disclosed to other health professions regulatory colleges in Ontario and in other jurisdictions. In all cases when disclosure of this type is made, the College shall ensure that disclosure complies any applicable legislation. Under the RHPA Procedural Code, discipline hearings conducted by the Discipline Committee are generally open to the public. Evidence at a discipline hearing may include personal information regarding the member and the member's patients, employers and colleagues related to allegations of professional misconduct or incompetence. Under the RHPA Procedural Code and the College bylaws, the College is required to publish certain information pertaining to discipline and Inquiries, Complaints and Reports outcomes. Under the RHPA Procedural Code, the panel of the Discipline Committee has the discretion to close a hearing under certain prescribed circumstances and/or restrict the publication of personal information where appropriate. Under the RHPA Procedural Code, reviews of decisions of the Inquiries, Complaints and Reports Committee and Registration Committee by the Board are open to the public. Similarly, the Board has the discretion to restrict the disclosure of personal information in its review process. The primary objective of these regulatory processes is always the protection of the public. The College has a record retention policy in place and conducts regular audits to ensure that personal information that is no longer required to be kept is destroyed, erased or made anonymous. The College’s Record Retention Policy can be obtained by contacting the College. It is in the best interest of the public that the College collects, uses and discloses only accurate personal information in regulating the profession. The College therefore uses its best efforts to ensure that the information it collects, uses and discloses is accurate. However, in order to be accountable for its collection, use and disclosure of information, the College may make corrections to information without obliterating the original entry. Members are required to provide the College with current name, contact and employment information and to advise the College of changes within thirty (30) days of any change. This information is verified annually when members renew their registration with the College. The College ensures that personal information it holds is secure. The College ensures that personal information is stored in electronic and physical files that are secure. Security measures are in place to safeguard this information which include restricting access to personal information to authorized personnel, ensuring that physical files are under lock and key and ensuring that electronic files are password protected. The College reviews its security measures at minimum, every two years to ensure that all personal information is secure. Employees of the College receive an orientation and ongoing training regarding the information safeguards required for personal information and their importance. The College ensures that personal information that is no longer required to be retained is disposed of in a confidential and secure fashion (i.e. shredding and deletion of electronic records). Inquiries concerning the College’s policies and practices for collecting, using and disclosing personal information may be directed to the Registrar & ED at 416-598-1725 or 1-800-668-4990. Where the College holds personal information about an individual, upon written request, the College shall allow access to the information to that individual, unless providing access could reasonably be expected to interfere with the administration or enforcement of the Legislation or it is impracticable or impossible for the College to retrieve the information. In cases where the personal information forms part of a record created by another organization, the College will refer the individual to the organization that created the record (unless it is inappropriate to do so) so that the individual may obtain access to the personal information from the organization rather than the College. While the College's response will typically be provided at no cost or minimal cost to the individual, depending on the nature of the request and the amount of information involved, the College reserves the right to impose a cost recovery fee. In these circumstances, the College will inform the individual of the approximate cost to provide the response and proceed upon payment by the individual of the cost. The College will make every effort to respond to the request within thirty days and to assist the individual in understanding the information. In the event the College refuses to provide access to all of the personal information it holds, then the College will provide reasons for denying access. The individual may then choose to file a complaint with the Registrar. An individual has the right to request a correction of what in his or her view, is erroneous information. Where the information forms part of a record created by another organization, then the College will refer the individual to the organization that created the record (unless it is inappropriate to do so) so that the individual may challenge the accuracy or completeness of the information. Where an individual is able to successfully demonstrate that personal information of a factual nature (not, for example, the expression of an opinion) is inaccurate or incomplete, the College will amend the information (i.e., correct, or add information). In addition, where appropriate, the College will notify any third parties to whom the College has disclosed the erroneous information. Where there is a dispute between the individual and the College as to the accuracy or completeness of the information, then the College will document the details of the disagreement, and, where appropriate, will advise any third party who received the contested information from the College, of the unresolved disagreement. Complaints or questions regarding the College's compliance with this Privacy Code should be directed to the Registrar who can be reached at College of Dietitians of Ontario 5775 Yonge Street, Suite 1810, Toronto, Ontario, M2M 4J1, 416-598-1725, 1800-668-4990. Taking appropriate measures where the complaint is found to be justified. Please note that there is a different process for handling complaints about the conduct or actions of a member of the College. Please contact the Registrar if you wish to file a complaint about the conduct or actions of a member of the College. (j) with the written consent of the person to whom the information relates. 2007, c. 10, Sched. M, s. 7 (1). (1.2) In clause (1) (e), “law enforcement proceeding” means a proceeding in a court or tribunal that could result in a penalty or sanction being imposed. 1998, c. 18, Sched. G, s. 7 (2); 2007, c. 10, Sched. M, s. 7 (2). (1.3) No person or member described in subsection (1) shall disclose, under clause (1) (e), any information with respect to a person other than a member. 1998, c. 18, Sched. G, s. 7 (2); 2007, c. 10, Sched. M, s. 7 (3). (1.4) Nothing in clause (1) (e) shall require a person described in subsection (1) to disclose information to a police officer unless the information is required to be produced under a warrant. 1998, c. 18, Sched. G, s. 7 (2); 2007, c. 10, Sched. M, s. 7 (4). (1.5) Information disclosed under clause (l) (g) shall be limited to the fact that an investigation is or is not underway and shall not include any other information. 2007, c. 10, Sched. M, s. 7 (5). 36.1 (1) At the request of the Minister, a College shall collect information directly from members of the College as is reasonably necessary for the purpose of Ministry health human resources planning. 2007, c. 10, Sched. M, s. 8. (2) A unique identifier shall be assigned by the Minister or a person designated by the Minister for each member of a College from whom information is collected under subsection (1). 2009, c. 26, s. 24 (7). (2.1) The unique identifier shall be in the form and manner specified by the Minister. 2009, c. 26, s. 24 (7). (3) A member of a College who receives a request for information for the purpose of subsection (1) shall provide the information to the College within the time period and in the form and manner specified by the College. 2007, c. 10, Sched. M, s. 8. (4) A College shall disclose the information collected under subsection (1) to the Minister within the time period and in the form and manner specified by the Minister. 2007, c. 10, Sched. M, s. 8. (5) The Minister may use and disclose the information only for the purpose set out under subsection (1), and shall not use or collect personal information if other information will serve the purpose, and shall not use or collect more personal information than is necessary for the purpose. 2007, c. 10, Sched. M, s. 8. (6) The Minister may publish reports and other documents using information provided to him or her by a College under this section for the purpose set out in subsection (1), and for that purpose only, but the Minister shall not include any personal information about a member of a College in such reports or documents. 2007, c. 10, Sched. M, s. 8. (b) any other public method that may be prescribed. 2007, c. 10, Sched. M, s. 8. (8) If the Minister publishes a notice referred to under subsection (7), the Minister shall advise the College of the notice and the College shall also publish a notice about the collection on the College’s website within 20 days of receiving the advice from the Minister. 2007, c. 10, Sched. M, s. 8. “Ministry” means the Ministry of Health and Long-Term Care. (“ministère”) 2007, c. 10, Sched. M, s. 8. All employees, contracted consultants and volunteers of the College of Dietitians of Ontario will maintain confidentiality with respect to all information obtained at the College as outlined in Section 36 of the Regulated Health Professions Act(RHPA) , 1991. A breach of confidentiality will result in disciplinary sanctions which may include dismissal and/or legal actions. Every employee, contracted consultant and volunteer shall sign an agreement to preserve secrecy of all information (relating to College business, members of other staff members) that comes to his/her knowledge in the course of his/her duties at the College. This may be an independent agreement or a confidentiality clause within an employment/service contract. Every employee, contracted consultant and volunteers shall refrain from divulging any College information (in any medium) to individuals external to the College or to any College personnel (Council, Non-Council, staff or volunteer) who should not have any knowledge of the information. This condition holds during as well as subsequent to the person’s association with the College. Exceptions are made to the release of information which has been authorized by College policies which are consistent with Section 36 of the RHPA, 1991. Employees, contracted consultants or volunteers shall not make any statement to individuals external to the College without the prior approval of the Registrar. Upon termination of employment, contract or volunteer work with the College, the individual shall return immediately, all property of the College in his/her possession or control including, but not limited to, all records, documents and materials. Any breach of the above policy and procedures will result in disciplinary sanctions which may include dismissal as well as legal sanctions. The employees’, contracted consultants’, or volunteers’ obligations to maintain confidentiality to all information obtained at the College as outlined above, shall continue after he or she leaves the employment or service of the College.